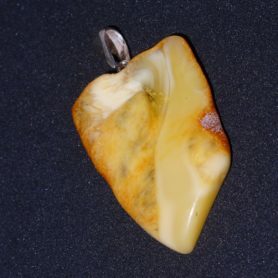 We are “Hand Made Amber”, a Swiss webshop that sells real, unique and exclusive hand made amber artpieces. Our products are all unique, natural and made by hand. We personally control the whole process – from finding amber until the final product. In us, you can trust. Our webshop is open for you during 7 days a week and 24 hours a day. Humanity has evolved the last 6 million years. 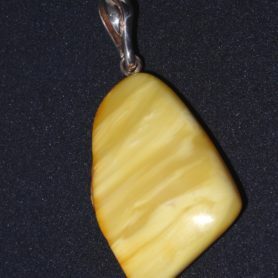 The baltic amber needed around 44 million years. 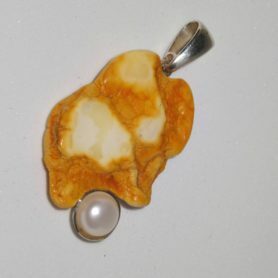 We guarantee you that each product in our shop is produced from real amber. We personally control the whole process - from finding amber to the final product. 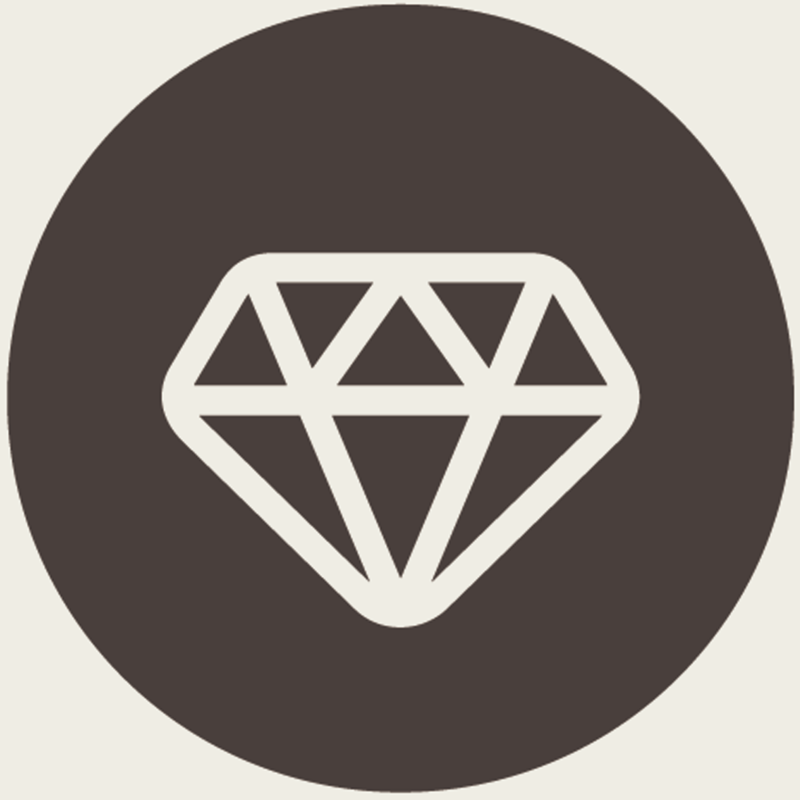 Our webshop is operated in Switzerland and uses up to date security, as a secure https connection. 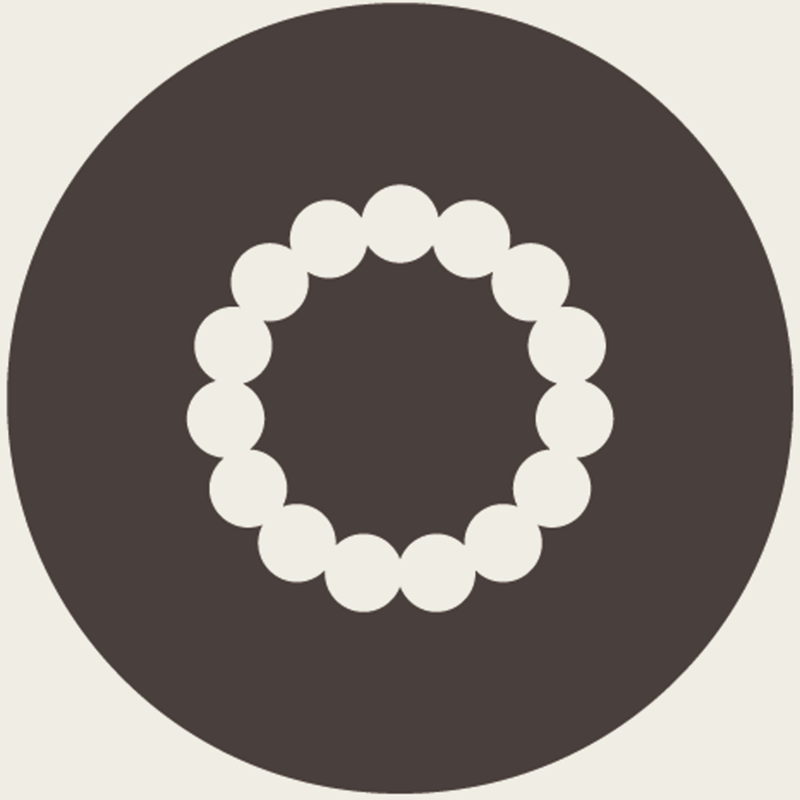 Following you find a selection of our newest products in the shop. To see all products, click on one of the big product category buttons above or use the top menu to click on the link “Shop“. 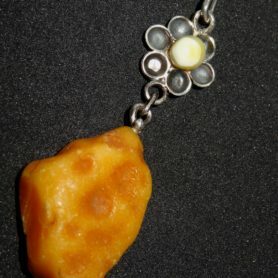 Earrings on silver necklace with clear amber Please note the delivery time under "Additional Information". This item is in stock. For further information (quality, materials, mass, weight, etc. ), please refer to the product description below. All of our products are handmade and therefore unique (that is, our products only exist once, which makes the pieces particularly valuable and is the reason why you can order the product at most once). 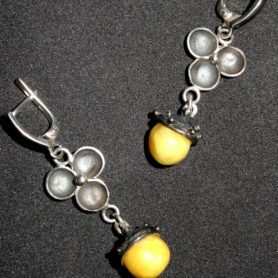 Note to earrings: The earrings are handmade and the amber is a natural product. Do not expect identical pieces. 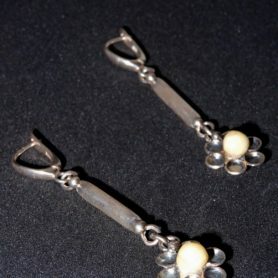 The earrings are custom made, but it is in the nature of the product that they are slightly different. 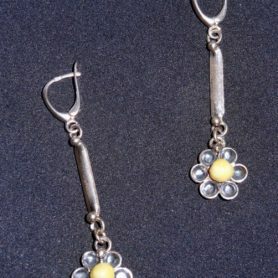 Earrings with silver flower and white amber in silver setting Please note the delivery time under "Additional Information". This item is in stock. For further information (quality, materials, mass, weight, etc. ), please refer to the product description below. All of our products are handmade and therefore unique (that is, our products only exist once, which makes the pieces particularly valuable and is the reason why you can order the product at most once). Note to earrings: The earrings are handmade and the amber is a natural product. Do not expect identical pieces. The earrings are custom made, but it is in the nature of the product that they are slightly different. 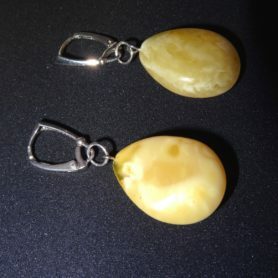 Earrings silver with white cognac colored amber polished Please note the delivery time under "Additional Information". This item is in stock. For further information (quality, materials, mass, weight, etc. ), please refer to the product description below. All of our products are handmade and therefore unique (that is, our products only exist once, which makes the pieces particularly valuable and is the reason why you can order the product at most once). Note to earrings: The earrings are handmade and the amber is a natural product. Do not expect identical pieces. 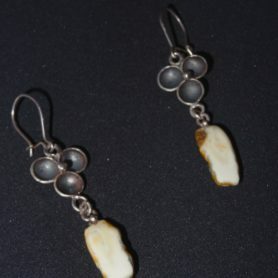 The earrings are custom made, but it is in the nature of the product that they are slightly different. 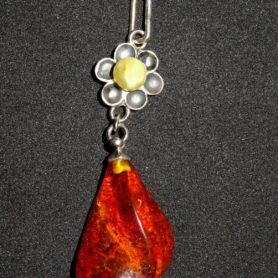 Earrings with silver flower and small white amber Please note the delivery time under "Additional Information". This item is in stock. For further information (quality, materials, mass, weight, etc. ), please refer to the product description below. All of our products are handmade and therefore unique (that is, our products only exist once, which makes the pieces particularly valuable and is the reason why you can order the product at most once). 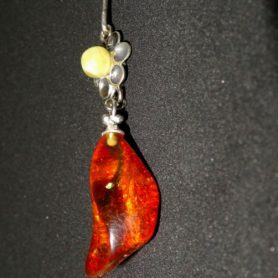 Note to earrings: The earrings are handmade and the amber is a natural product. Do not expect identical pieces. The earrings are custom made, but it is in the nature of the product that they are slightly different. 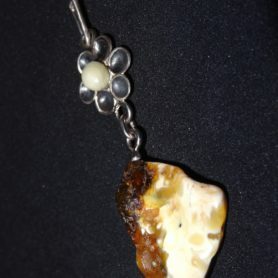 Pendant with silver flower and clear, dark amber in dark cognac colors Please note the delivery time under "Additional Information". This item is in stock. For further information (quality, materials, mass, weight, etc. ), please refer to the product description below. All of our products are handmade and therefore unique (that is, our products only exist once, which makes the pieces particularly valuable and is the reason why you can order the product at most once). 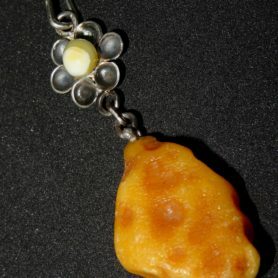 Note to earrings: The earrings are handmade and the amber is a natural product. Do not expect identical pieces. The earrings are custom made, but it is in the nature of the product that they are slightly different. 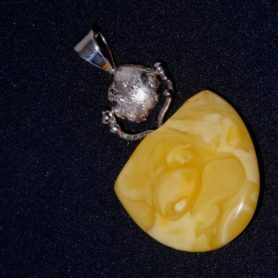 Set: Earrings silver and pendant silver with white amber Please note the delivery time under "Additional Information". This item is in stock. For further information (quality, materials, mass, weight, etc. ), please refer to the product description below. All of our products are handmade and therefore unique (that is, our products only exist once, which makes the pieces particularly valuable and is the reason why you can order the product at most once). Note to earrings: The earrings are handmade and the amber is a natural product. Do not expect identical pieces. The earrings are custom made, but it is in the nature of the product that they are slightly different. 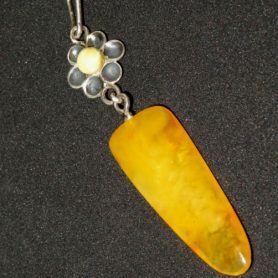 Pendant with silver flower and almost clear cognac-colored amber Please note the delivery time under "Additional Information". This item is in stock. For further information (quality, materials, mass, weight, etc. ), please refer to the product description below. All of our products are handmade and therefore unique (that is, our products only exist once, which makes the pieces particularly valuable and is the reason why you can order the product at most once). Note to earrings: The earrings are handmade and the amber is a natural product. Do not expect identical pieces. 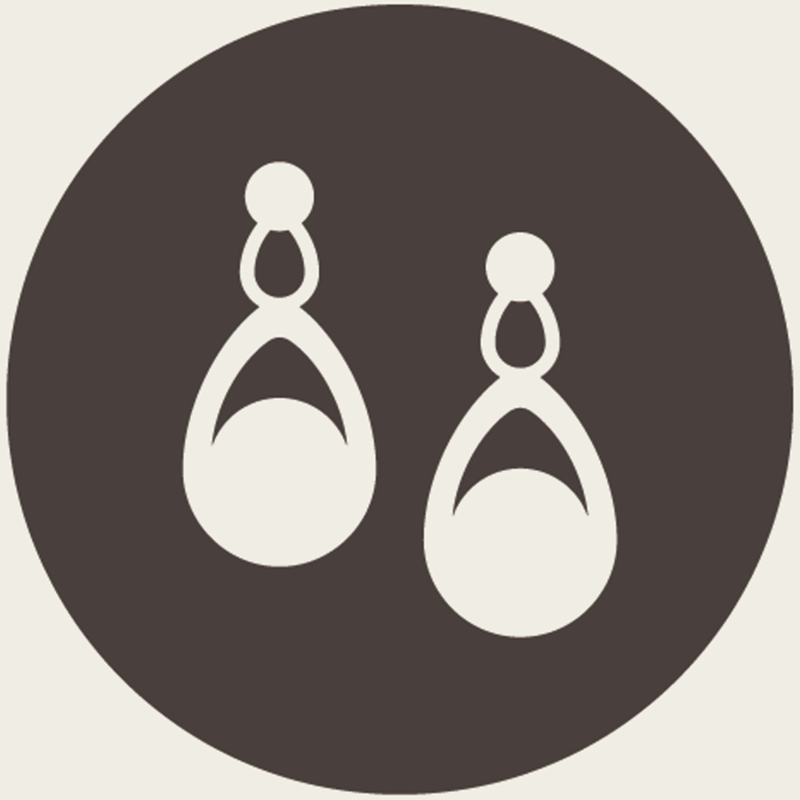 The earrings are custom made, but it is in the nature of the product that they are slightly different. Brooch with silver adornment and zirconia stone with white cognac-colored amber Please note the delivery time under "Additional Information". This item is in stock. For further information (quality, materials, mass, weight, etc. ), please refer to the product description below. All of our products are handmade and therefore unique (that is, our products only exist once, which makes the pieces particularly valuable and is the reason why you can order the product at most once). 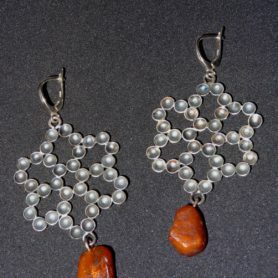 Note to earrings: The earrings are handmade and the amber is a natural product. Do not expect identical pieces. The earrings are custom made, but it is in the nature of the product that they are slightly different. 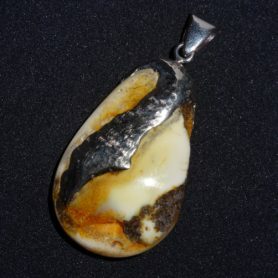 Pendant with silver pendant and large white-cognac-colored amber Please note the delivery time under "Additional Information". This item is in stock. For further information (quality, materials, mass, weight, etc. ), please refer to the product description below. All of our products are handmade and therefore unique (that is, our products only exist once, which makes the pieces particularly valuable and is the reason why you can order the product at most once). 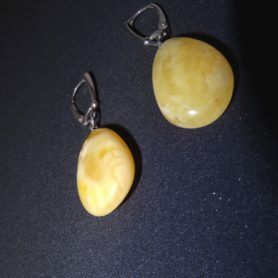 Note to earrings: The earrings are handmade and the amber is a natural product. Do not expect identical pieces. The earrings are custom made, but it is in the nature of the product that they are slightly different. 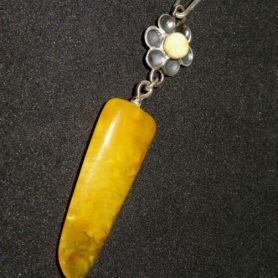 Pendant with silver flower and natural amber with silver ornaments Please note the delivery time under "Additional Information". This item is in stock. For further information (quality, materials, mass, weight, etc. ), please refer to the product description below. All of our products are handmade and therefore unique (that is, our products only exist once, which makes the pieces particularly valuable and is the reason why you can order the product at most once). Note to earrings: The earrings are handmade and the amber is a natural product. Do not expect identical pieces. The earrings are custom made, but it is in the nature of the product that they are slightly different. 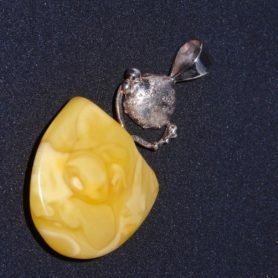 Brooch silver dark with 3 white amber stones Please note the delivery time under "Additional Information". This item is in stock. For further information (quality, materials, mass, weight, etc. ), please refer to the product description below. All of our products are handmade and therefore unique (that is, our products only exist once, which makes the pieces particularly valuable and is the reason why you can order the product at most once). Note to earrings: The earrings are handmade and the amber is a natural product. Do not expect identical pieces. The earrings are custom made, but it is in the nature of the product that they are slightly different. 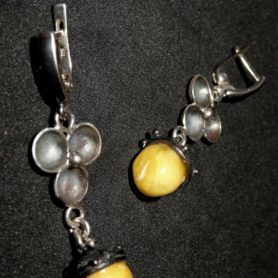 Earrings silver with multicolored rather dark amber beautifully shining Please note the delivery time under "Additional Information". This item is in stock. For further information (quality, materials, mass, weight, etc. ), please refer to the product description below. 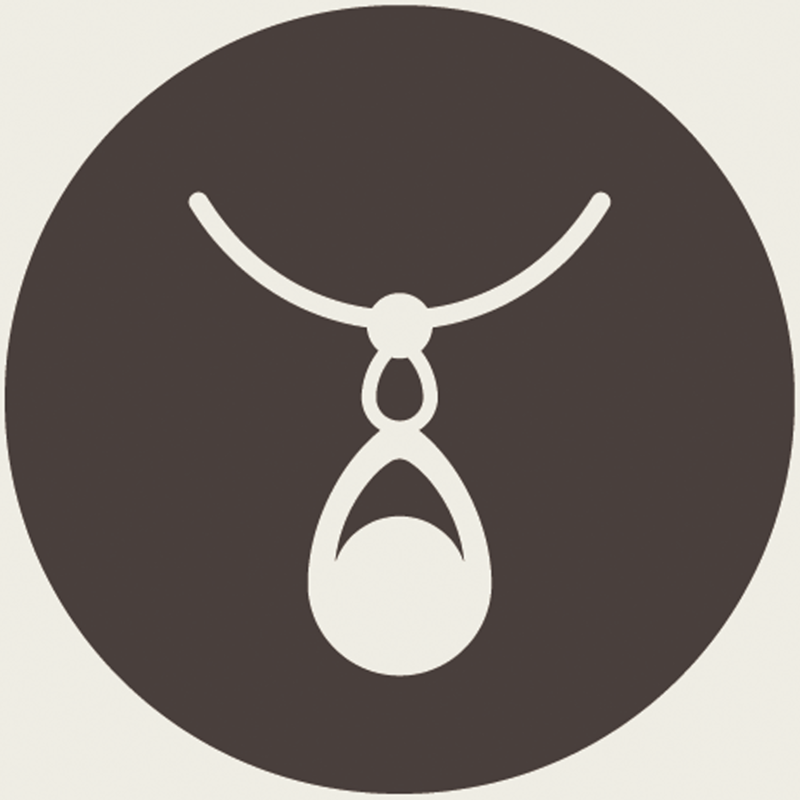 All of our products are handmade and therefore unique (that is, our products only exist once, which makes the pieces particularly valuable and is the reason why you can order the product at most once). 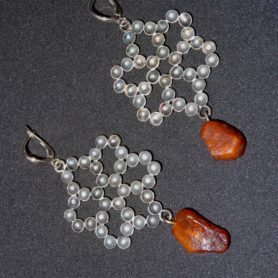 Note to earrings: The earrings are handmade and the amber is a natural product. Do not expect identical pieces. The earrings are custom made, but it is in the nature of the product that they are slightly different. 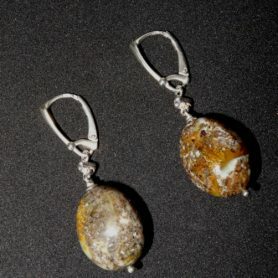 Earrings with large silver creation and cognac-colored amber Please note the delivery time under "Additional Information". This item is in stock. For further information (quality, materials, mass, weight, etc. ), please refer to the product description below. All of our products are handmade and therefore unique (that is, our products only exist once, which makes the pieces particularly valuable and is the reason why you can order the product at most once). 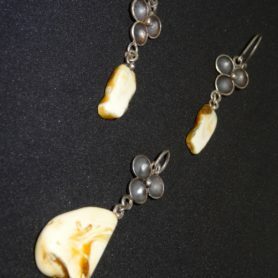 Note to earrings: The earrings are handmade and the amber is a natural product. Do not expect identical pieces. The earrings are custom made, but it is in the nature of the product that they are slightly different. 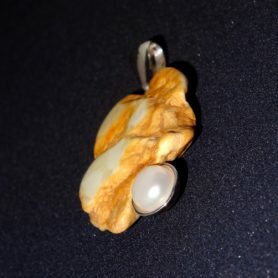 Necklace leather with pendant white amber with silver ornaments Please note the delivery time under "Additional Information". This item is in stock. For further information (quality, materials, mass, weight, etc. ), please refer to the product description below. All of our products are handmade and therefore unique (that is, our products only exist once, which makes the pieces particularly valuable and is the reason why you can order the product at most once). 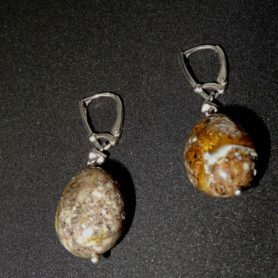 Note to earrings: The earrings are handmade and the amber is a natural product. Do not expect identical pieces. The earrings are custom made, but it is in the nature of the product that they are slightly different. 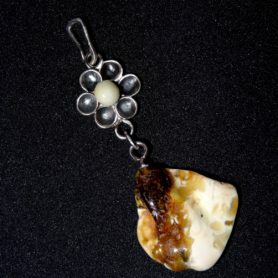 Pendant with silver flower and complex amber (white / black / cognac) Please note the delivery time under "Additional Information". This item is in stock. For further information (quality, materials, mass, weight, etc. ), please refer to the product description below. All of our products are handmade and therefore unique (that is, our products only exist once, which makes the pieces particularly valuable and is the reason why you can order the product at most once). Note to earrings: The earrings are handmade and the amber is a natural product. Do not expect identical pieces. The earrings are custom made, but it is in the nature of the product that they are slightly different. Above you find a selection of our newest products in the shop. To see all products, click on one of the big product category buttons above or use the top menu to click on the link “Shop“. We are delivering as fast as possible. In our webshop you can already see expected delivery times while shopping. So no negative surprises for you. And you and our high quality products deserve nothing else, but also beautiful and high quality packaging (more information on packaging). In our shop you can pay for sure! Pay totally safe with your credit card through Paypal or Amazon Payment gateway (both are today’s standard and most used online payment processors). We not only offer high quality products to you, but also a very modern shopping experience. It does not matter if you’re using your PC, notebook, tablet or mobile phone. 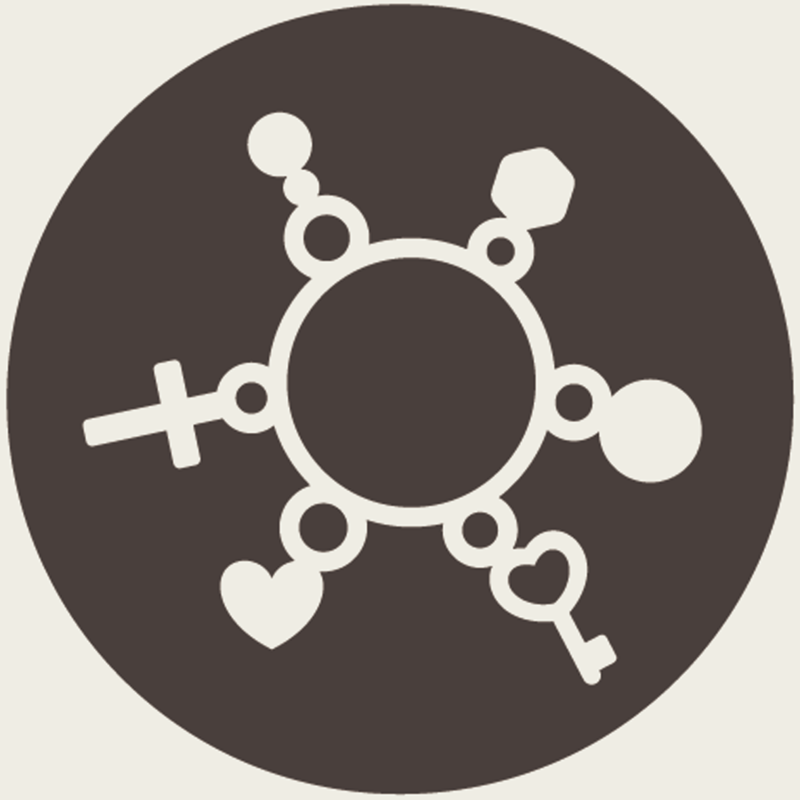 To top that we only offer secure https connections to you, secured with a security certificate from LetsEncrypt.org. Shop safely with us! In our shop you can find only high quality products. Other things we do not have. Our products are personally selected from small, talented and creative manufacturers that work with passion. 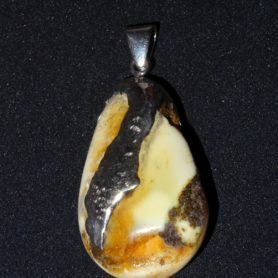 We personally control the whole process – from finding the best amber to the final product. That is why here you get only unique and hand made artpieces of highest quality. Nothing else! 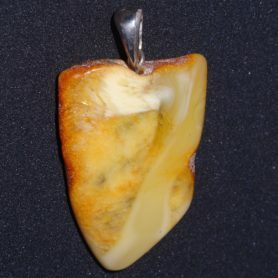 Amber is a natural product and has culture & tradition. Its producer is the nature, which has take its time (up to more than 100’000’000 years). 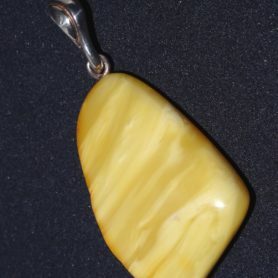 The amber is beeing found using no chemical or other additives and with taking care about the environment. Our products don’t damage nature! 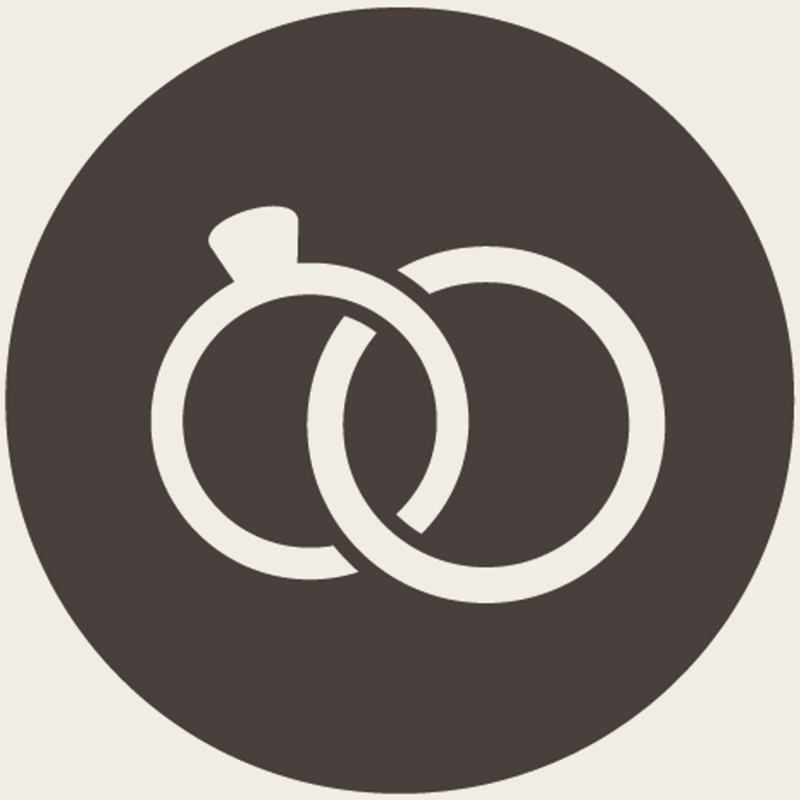 We work with passion for you! We love amber and want to pass on high quality products and enthusiasm. That’s why in our shop you can’t find anything but highest quality products. We also treat our personally selected manufacturers very well and pay them fair. We like fairness to all sides. We guarantee you that without excemption – now and forever!